When I started my weight loss and healthy living journey, I knew that portion control was going to be a key part of changing my eating habits. My perspective on what was considered to be “one helping” was a little out of whack. “What do you mean I can’t eat four heaping bowls of quinoa?! Quinoa’s healthy, so what’s the problem?” Yeah. Of course, I didn’t REALLY think it was okay to eat as much as my husband at dinnertime, then sneak into the fridge later for leftovers. I just didn’t want to stop eating because I was bored, angry, happy…darn that emotional eating! When I started tracking my meals and snacks on MyFitnessPal, I knew that it wasn’t going to be pretty. The amount of cheese and crackers I typically grazed on for an afternoon “snack” took up nearly one-half of my allotted calories for the day. Even the healthy grains, such as brown rice, whole wheat couscous and quinoa, were consumed in portions much too big for one person, particularly a person who can barely reach the top shelf of the pantry. So, I started weighing and measuring, with the intention of eventually being able to “eyeball” the portions. Stashing a scale and measuring cup in my purse to take to dinner at our favorite restaurant wasn’t exactly an option. People already think it’s odd when I snap pictures of the food. No need to give them more reasons to stare. But how the heck was I going to “eyeball” four ounces of chicken or a half-cup of rice? The first thing I did was to pull out my handy OXO scale and measuring cups (more about those in the giveaway section), which I use for everything from measuring baking ingredients to weighing out meal portions. I began by weighing and measuring everything – not because I planned to do that forever, but because I wanted to familiarize myself with how a healthy portion looked. After several times of measuring out 1 cup of spinach, 1/2 cup of brown rice and 2 ounces of turkey meat, I became comfortable with serving up these portions without always relying on the scale and measuring cups. I knew that a serving of leafy greens filled about three-quarters of our wooden salad bowls and a half-cup portion of berries perfectly lined the bottom of my cereal bowl. I still weigh and measure periodically to make sure that I am on track with my estimates. I also learned some little tricks. Whether or not you want to record your meals and snacks for the long-term, I suggest tracking them for several days. It’s eye-opening and, quite frankly, a little shocking. At least it was for me. The beauty of an app such as MyFitnessPal is that it also breaks down your daily nutrient intake. I quickly learned that I was pathetically low on iron and potassium. How many times have I eaten a snack straight from the bag while standing at the counter? I don’t even want to think about it. It’s that kind of mindless eating that got me in trouble in the first place. Here are some things that I tried to change. Believe me, I don’t do them all the time, but I figure “often” is better than “never”. 1. Sit down to eat. For some reason, standing to eat just leads me to eat more. Perhaps it’s because I’m standing near the source of the food. 2. Use smaller plates and bowls. If I put a portion of pasta in a large bowl, I feel cheated. It looks like a miniscule portion and I’m convinced that I should pile more in. 3. Step away from the phone, iPad, computer, TV or any other distractions. If I don’t think about eating, then the food is gone before I’ve ever had the chance to taste it. 4. Take a sip of water after every few bites. Not only does this help me stay hydrated and satiated, it also slows me down. Seriously, I can inhale a meal in five minutes flat if I don’t stop myself. Typically, it takes about 20 minutes for the stomach to tell the brain it’s full. Give it a chance to do so! 5. Don’t let yourself get too hungry. If I sit down to a meal when I’m famished, I’m more likely to chow down…quickly and alot. That’s why eating regular, healthy meals and snacks is really important. I would love to hear some of your tricks and tips for portion control and conscious eating. Feel free to leave your ideas in the comment section. For a chance to win these indispensable weighing and measuring tools from OXO, just leave a comment on this post. Read below for instructions on earning extra entries. 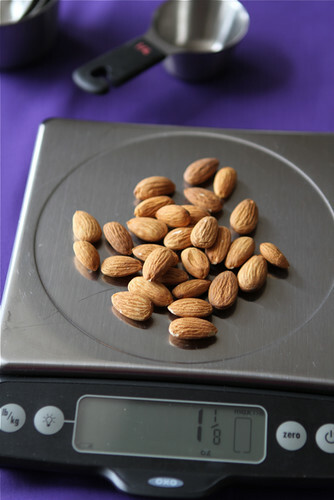 Food Scale with Pull-Out Display – This scale measure in grams and ounces, has a pull-out display so that you can place large bowls on the scale and “zeroes” the weight of the bowl so you get an accurate measurement of what’s inside. Stainless Steel Measuring Cups – Not only do I love the look of these measuring cups, but they are also very comfortable to hold. This giveaway is open to residents of the United States 18 years of age or older (I apologize to my Canadian readers – I promise there will be giveaways for you in the future) and will be open until Tuesday, March 20, 2012 at 5pm PST. Disclaimer: This post is sponsored by OXO and they supplied me with some OXO products for my personal use and the giveaway. As usual, all opinions are my own. What can I say? I’m an OXO fan. I love these tools! I am totally with you on portion control, as long as I have the *right* amount I don’t feel like I’m going without. It works! Wow – you look AMAZING. I remember when I first followed you on Twitter, how I thought you were the prettiest food blogger out there – and you looked great “before,” too. But you are smokin’ now! 😉 I need to get back to better portion control. I’m a runner, too, and when I’m training for marathons, I sometimes feel a little too entitled, when I’m actually not. Thanks for this post! Thankyou for your honesty in these weight loss posts. It’s hard enough for me to confess to MYSELF that I’ve been eating portion sizes that are way out of control, much less confessing it to the internet. I have been hesitating with joining WW online just to keep track of what I’m eating, but this app actually sounds like a better starting point – & I am downloading it now, in fact! Again, thankyou for these posts which are striking and reassuring in their honesty. Congrats on your weight loss. I’m working hard to lose weight and get healthy, too. 14 pounds so far! These tools would certainly come in handy! Portion control is something I’ve always struggled with! Perhaps winning that scale would get me on track! This is such a great giveaway! Oxo has such great kitchen tools! I loooove Oxo! And these tools look bad to the BONE. What a wonderful giveaway! I really need to tighten up portion control and this would help. I never realized how distorted my portion control is. Wow! Thank you for continuing to share your story! Its always encouraging to hear what works for someone else! Isn’t controlling our portions hard?!? Sometimes I find that I do it naturally but other times I get frustrated when I see how much my fiance can consume without a worry! My trick is to always wait 20 minutes after dinner to eat dessert. I’m one of those where it takes me 20 or so minutes to actually feel “full”, so if I immediately eat dessert, I tend to overeat. Hey there! I rarely post, but I wanted to thank you for posting this because I don’t think others recognize the importance of knowing your servings! I’ve lost over 40 pounds doing this over the years. I also dip my salads, not pour. That’s been a biggie because I eat A LOT of fresh vegetables. If it makes you feel better, retraining myself to recognize reasonable portions has made maintaining what I did lose oh, so much easier, so it might be a bummer now but it will pay off in the long run. I also learned not to eat dessert until I did my evening exercise (walking/jogging in my case). One, it gave me incentive to actually do the exercise and, two, once I was done, I wanted a big glass of water more than I wanted something sweet, so I ate less and didn’t feel like I’d given anything up. I’ve been thinking of buying a food scale to assist in my weight-loss journey…perfect! 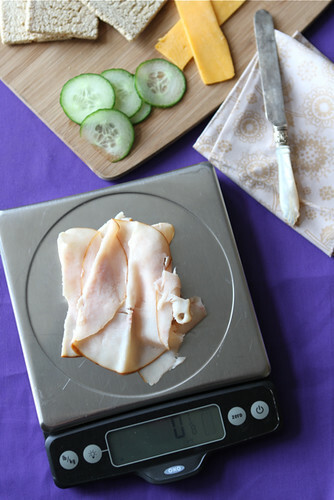 I have never used a scale to weigh portions but would love to win so I could try it…..thanks for the giveaway! I love my scale! We also bought a couple of extra measuring cup/spoon sets and have them all in a basket in the cupboard – so we are never without the measuring implement we need. I wanted to also thank you for recommending myfitnesspal! I had been using spark people, but myfitnesspal is SO much more streamlined and so much easier to enter everything into. So, thanks! Hi Tyla, thanks so much for commenting. If you want to “friend” me on MyFitnessPal, my username is CookinCanuck. It’s always more motivating to have friends on there! I have a cheap digital scale that I picked up years ago. I have had that specific model of OXO on my wishlist for awhile. I also liked cookin canuck on facebook! I love your recipes and pictures, thanks for the inspiration to eat better! I followed Cookin Canuck on twitter. 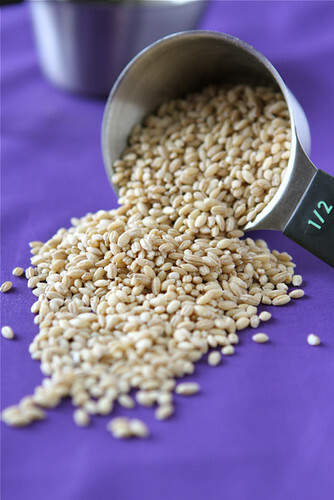 It’s funny you mention “4 cups of quinoa,” I could not believe how many calories are actually in this healthy grain (seed). I add a couple teaspoons to my salads to help feel full, add texture, and enjoy the over all flavor. Half a cup, four ounces, heck, it’s hard to guess. I’ve gotten in the habit of using measuring spoons for stuff like sugar in my tea, but I need to work on using measuring cups/weights for bigger stuff. Thanks for all the great tips! I’ve been meaning to add a scale to my kitchen gadgets. thanks for giving us an idea on portions. great explanations. Portion control is really key. Also, really difficult at first. Thanks for the rundown. I would love to win this so I can weigh my portions! I could really use that scale–I have a really old, non-digital one and I often wonder how accurate it is! Portion control is one of the hardest, but one of the most necessary parts of changing your lifestyle. Congratulations to you for learning how to manage this! Yes, when you begin to measure/weigh and write EVERYTHING down, you see results. I am always surprised how quickly I forget something I ate if I don’t write it down immediately before or after eating it. This is a great prize! Would love to finally lose my last 10 lbs and portion control just may be the way to do it! I liked OXO’s facebook page. I do the same thing. I typically eat really healthy foods but tend to eat WAY too much of them. Measuring is really important! I followed OXO on Twitter! I liked OXO on Facebook! I’d love to win this! I’ve been on the hunt for a good scale for ages and just never get around to getting one. Plus? I am in desperate need of portion control. Sad, but true! I have been thinking I need to be more aware of the size of portions I serve.myself. Thank you for this post…! You have officially inspired me to start weighing and measuring my foods, as well as jumping back on the MyFitnessPal bandwagon to start eating (and feeling!) healthier. I am much more conscious about WHAT I am eating, HOW MUCH I am eating, and WHEN I am eating it when I am also in an exercise routine. When it takes as long as it does to burn off 200 calories, I’m much more careful about squandering it!!! Weighing it would only make me more accountable. This is the most accurate way to assure appropriate sizes of portions. You look great and have inspired me to download Lose It on my iphone. Also, I made your stuffed shells last night for the second time. My son and I just love them! My approach to portion control when eating out was to cut everything in half and put the second half in a take-home box. I cut way back when eating at home, too. When I was diagnosed with Diabetes, I met with a Diabetes Educator/Nutritionist and she gave me an eating plan. Then I set about measuring all my carb choices. You quickly learn to judge your portions of most foods by sight. I’ve lost 40 pounds. I like to add mushrooms/veggies/tomatoes to my single serving of pasta. It makes it look like I’m eating a lot more pasta than I really am. I also like to toss it with a bit of olive oil and black pepper instead of butter or other sauces. Portion control is the only way to go. Love the scale and measuring cups. I’m the worst at portion control so these tools would be amazing to get my eating in order!! Great post! I started following Cookin Canuck on Pinterest. I’ve recently started a weight loss program, again! These tips are great and I know from past experience (LOTS of experience!!) that they work! I have a set of serving spoons that are 1 C. and 1/2 C. exactly and I use them all the time… takes the guess work out, which is never a good idea anyway! I have always wanted a scale for those items that can’t be measured w/ a cup or spoon… maybe?? 🙂 Thanks for reminding me of these important tips today!! I’ve always wanted a food scale. I’d especially love a free one! I’m following Cookin’ Canuck on Pinterest. I’m guilty of snacking out of the bag too… and the worst part is, I know that its bad, but keep on munching anyways! I follow Cookin’ Canuck on facebook! I know I eat way tooooo much! I need to start measuring. This should help! I would love a food scale! I keep looking to buy one but I haven’t done it yet. Free would be great! Oh, I have been lusting after this scale! Not only for portion control, but improving my baking as well. I love this idea. I am toying with the idea of being more healthy and I have made some good positive changes, but I know I need to do more. This might be the way to make me do it properly. Great tools … even better info! I have often thought that my personal weight demon is an out of whack portion control “meter”! I shared your info on my Facebook page, I “liked” OXO and also “liked” Cookin’ Canuck on Facebook! Sorry, but I am not on Twitter at this time. I have a trick that I LOVE! I eat a lot of leftovers and a lot of soups. When I’m reheating something like a soup or stir fry I’ll line the bowl first with a handful of spinach or arugula. Then top it with soup. This keeps me from over-filling the bowl, as I have a tendency to do, and adds some extra greens to the meal. The spinach wilts with the heat of the microwave and is always a tasty addition! I am so impressed by your weightloss journey. It’s amazing to see someone make a successful and healthy change. Also, I love OXO products! I have been a follower of your blog for awhile now! I have recently started my weight loss journey! I am at my halfway point and I cannot seem to break through my “Plateau”. Thank you for the great giveaway!!! I like OXO on Facebook! they have such great stuff; the majority of my kitchen stuff has come from them! What a wonderful giveaway! I’ll take the almonds, too! Putting down my fork in between bites have really helped me. OXO has great products; they are one of my favorite brands! I love your comparisons for portion size, very clever! Great post! I have followed you faithfully on Twitter for awhile! 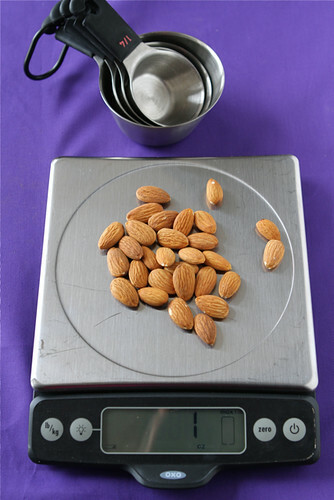 Portion control is a great way to stay aware of what and how much you are eating! Love this scale. I just liked OXO on FB! I already follow you on Pinterest … lucky me! Great advice and a great giveaway! This scale would be awesome. Thank you for this wonderful post reminding us about portion control. I know that is very important! I love OXO tools….I only have their can opener…. and, i already follow you on FB! I think weighing portions would help me with portion control; I tend to binge at night, otherwise. From one canuck to another I know portion control is the trick to success!!! Followed you on Twitter….have been reading blog and getting in my daily drool – nice to have your insight on portion control as I’m now working on eating healthy – and am following many of your steps. Biggest help for me is eating a small and balanced meal carb/protein every three hours. Keeps the blood sugar level and allows the body to learn how to use stored fuel! These look like great tools! Liked Cookin Canuk on FB! Portion control is my biggest hurdle! I really need to get a scale or become better at eating smaller portions! Great giveaway! I’m already following some of your boards on Pinterest! I would love to win, I think portion control is huge and like you I could eat 4 helpings of good Quinoa anyday. I have learned to only take one serving on a salad plate & don’t go back for seconds. That’s my portion control so far. I haven’t started weighing food yet, but I used to cook @ the Senior Center & had to take classes every year, so I did learn something! But knowing & doing are two different beasts!! This would be amazing to win, so useful! Need to learn how to do this the right way–way too easy to guess portion sizes wrong! Thanks for your post, what a great giveaway! I have kept a food diary before, per my doctor’s request, and it helped. I will start doing that again, thanks for all the tips. I like OX too. I hope to be able to giveaway their products on my blog too. Already following OXO on Twitter. Already following Cookin’ Canuck on Twitter. Already like OXO on Facebook. Already like Cookin’ Canuck on Facebook. Already following Cookin’ Canuck on Pinterest. I just recently found your site and absolutely love all the healthy tips and recipes you post!!! I need one of those scales to do portion control as well. We’re eating pretty healthy just too much I think. I love your recipes and hope to win this great prize! Fabulous post and great ideas! Oh yes I am a BIG believer in portion control! Great giveaway! Kitchen scales are so helpful! i like oxo on fbook! I have recently started measuring my food too, but I do not have a kitchen scale, so I just try to eyeball it, this would be sooo helpful! I follow you on Facebook and Twitter as well as get an e-mail from you. I joined My Fitness Pal at your suggestion and really like it. I think the more tools and mind pictures you have in your head, the harder it is to fool yourself on portion control. Thanks! I am already following CookinCanuck on Pinterest. I am already a Facebook fan of OXO. You’re right about the wake up call you get when you start tracking every single thing you put in your mouth on myfitnesspal. No wonder I wasn’t losing weight before. Have thought about buying a scale but haven’t invested yet, so would love to win one! Would love to have a kitchen scale! awesome scale! I need one so I can know exactly how much I’m eating! I tweeted about this giveaway. Handle is poohro. I’m following Cookin’ Canuck on Pinterest! I adore OXO!!! I couldn’t live without them!!! I never used to measure how much cereal I was eating for breakfast. Big mistake! Now I use a 1/4 cup so I can mix & match cereals. Every morning can be different. Thank you for such helpful tips..I absolutely believe in portion control and I think I need to buy the scale, seems very efficient! Great giveaway! OXO makes such good sturdy tools. i don’t have a facebook account nor know anything about twitter – can i get an extra entry for being an email subscriber? Thanks for providing the kickstart I needed to begin MyFitnessPal and make conscious choices about how and what I eat. You are an inspiring role model. While I can’t face a drink of water after each food bite, I have found that putting my fork down between bites is helpful. Hard to practice, but helpful. Liked you/oxo/did everything you asked but no twitter for me – anyhow – not sure how to do the date stamp thing – too much – anyhow -enter me – Love your blog & the way i do portion control is to dance/dance/dance. I’ve been dragging my feet on portion control….this is a good reminder. Sorry, I didn’t know how to show you the link. Best thing about the OXO scale is that it has both metric and English measurement options! OXO rocks! & so do you for having the giveaway! What great timing! My scale just died last week! Whenever I buy foods in bulk — or make a batch of quinoa, brown rice, oats, whatever — I measure them out in one-serving containers. That way they are all ready to go when I need them. And the same thing goes with any leftovers — measure them out and then put them right in the freezer. I love your tip about the water! Even though I always make sure to drink enough water through the day — I often forget it at mealtimes. It seems like a great way to slow down my eating! And I follow Oxo on Twitter (@lenaonthebeach) — LOVE their products! And now following you on Pinterest! This is such a great giveaway! Thank you for sharing the tips you learned along the way! I am following OXO on Twitter. I liked ‘Cookin’ Canuck on Facebook. I am following ‘Cookin’ Canuck on Pinterest. Great tips. I agree, a kitchen scale is so important in keeping our serving sizes in check. Once you learn, you can rely on it less, but great to start. long! This looks like a great one! The first time I read a post in which you mentioned MyFitnessPal (weeks/months ago), I downloaded and tried it, but ended up deciding that it was too tedious to record all my meals, every day. When you posted again about your weight-loss journey (with the before and afters), you got my attention! I started using the app again and it has helped me lose 5 lbs in 2 weeks. Like you, my portions were out of whack and I was snacking a lot after dinner. The calorie counter helped motivate me to “be good” and cut out needless snacking! These are really great tips, Dara! It’s something that I’ve realized I need to keep in mind more and more as my metabolism begins to slow. It ain’t what it used to be! I can definitely keep up with my husband in terms of portions, and he’s not only bigger than me but also exercises way more. What should be 4 portions for us is 2. Maybe it’s time for me to break out the scale! I also skip breakfast frequently, which I’ve read is not healthy. It’s better to get your metabolism started. Thanks so much for sharing these tips as well as the giveaway. I’ve been interested in weighing my food especially because, like you, I’m also on a weight loss and health journey and have been changing my eating style. I’d love to enter the giveaway, thank you so much for hosting it! I like OXO on twitter. it’s incredible how varied a serving of food is ! i too have an issue of shoving food in my face from the bag.. heh. i like oxo on facebook ! I first found you looking up a recipe and read your inspiring story and now I am doing myfitnesspal as well. It is eye opening!!! The recipe I tried was pasta salad with mint, basil and chicken. So yummy!! I have been doing great with my fitness pal however my difficult part of the month is coming up and I can already feel the cravings creeping up on me. I don’t own a scale of any kind in my home but will need to buy a body weight scale soon to track my weight. Thank you for all your helpful tips. I am going to follow you on twitter and Facebook as well! Cool giveaway! Oxo is my favorite as well. I liked you on Facebook – I also use myfitness pal and have started measuring things, but the scale would be so nice to keep myself entirely honest! Just started some stretching exercises-portion control will definitely follow! You’re right on with the portion control. I need a good reminder on that one. What a great giveaway. This is so important , since I have always been a “quantity” eater and not a “quality” eater. I am working hard( it’s a constant battle) to learn how to quality and not quantity. Thanks for the post! I sooo need a scale for portion control. I follow you through email. You look great! Well done on your weight loss, Dara! I never tried portion control, before. (Lord knows, I need to!!) What an incentive to try!! I’m on the same journey. Quite an eye opening experience, isn’t it! Congratulations on your success and wishing you years of continued success! I “like” OXO on FB. Portion control is my biggest problem (or going back for seconds). Great tips and great giveaway! What a wonderful give away. I don’t own a scale so I try to eyeball portions and I am sure I am off considerably. Thanks for the opportunity to win. I follow OXO and cooking canuck om facebook. You are an inspiration! And those are some really helpful tips. I hadn’t thought about several of them. Thank you. I followed Cookin’ Canuck on Pinterest. Congrats on your achievement ! I really need new measuring cups! I haven’t been using a scale, so I imagine that would come in handy, also. Thanks for the giveaway! i try to have a veggie course before the main meal, to fill me up with the good stuff so that i eat less of the heavy stuff. My scale broke a couple of months back, so it’s rough to bake as neatly! But on the portion control side, I realized I was eating around 800-1000 calories of trail mix a night! So THAT’S where my 8-miles of running is going. Awesome. Liked Cookin’ Canuck on fb! Portion contol is the hardest thing to do…a scale would help. Thanks for offering! Portions can be sneaky little things. A sample here and there surprisingly add up quick. I haven’t done so well with it lately. Thanks for the reminder, need to jump back on that bandwagon! Great post and great giveaway. I’ll definitely admit that my eating habits are nowhere near healthy. Thanks! I could really use a new kitchen scale. The one I have now is just barely holding together. thanks. these type of posts are so encouraging. the scale would come in hand so much!! Oh I would absolutely love this prize!! Portion control is definitely a challenge for me. Especially when it comes to snacking. I have to pull out the portion from the box, close the box and put the box away before I put that first snack in my mouth (I am referring to triscuits here 🙂 ) I tend to overdo it with anything crunchy and salty! What a fantastic giveaway Dara! I just liked Oxo on Facebook! i liked OXO on FB…. I control portions by weighing…but I don’t have nearly of deluxe of a scale. Would love this to help me continue with my weight loss journey. Wow, these tools look great!! I’m also a huge fan of the OXO brand! I only use their storage containers now. I’ve also followed you and OXO on Twitter. Thanks for doing this fun giveaway! You look fab! Congratulations on your weight loss and healthier lifestyle. I have also lost a ton o’weight and know how much better it feels to be the “new” me. All the best to all of us on the giveaway! What great tools! I absolutely know a scale would really help me keep account of how much I’m really putting on my plate! Thanks so much for these helpful tips!! You have no idea how much this would help me!! I liked Oxo on Facebook – I don’t do the twitter or have my own blog) Thank you for having this giveaway!! Good luck to me! * I liked YOU on Facebook!! Thank you for having this giveaway!! Good luck to me! Dara, I was familiar with your “approximations” list, except a potato the size of a computer mouse. 🙂 Leave it to you to bring me up to speed with the 20th century! 🙂 (21st century?!) Thanks for your tips on healthy (and proportional) eating. This is the next step that I need to add to my weight loss efforts. Thanks! The article is a transcript of an interview with Brian Wansink, a professor at Cornell who has spent his career studying eating behavior. Oh wow, these would be wonderful, and definitely help on my journey. 🙂 Thank you! I’ve always considered using measuring cups to portion out my food, but I never considered using a scale until I could ‘eyeball’ correct portions! Genius! I’m Also a Canadian living in the USA! I discovered your web site and you motivate me in keeping fit! Also you made me realize my habit of eating when bored,angry ,tired, happy…. but reading it is powerful, realize that we are all the same ! You rock girl I love your web site wish can meet you one day! A big thank you and many blessings!! You have helped me!! I’m so glad to hear that, Myra! Thank you for taking the time to comment.